Gunma Kenkyo Ryosen Trail means Gunma's northern prefectural border ridge line trail. It stretches along Gunma's northern borders with the prefectures of Nagano & Niigata. The trail has a length of 100km. It begins in Minakami-machi and finishes in Toriitoge Mountain in Tsumagoi-mura. 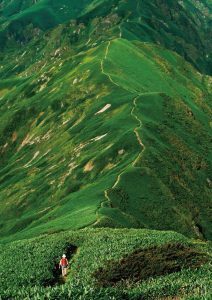 Some of the mountains on the trail are ranked among either the top 100 prefectural or top 100 national best mountains.